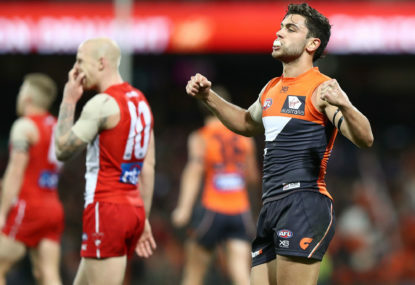 Following a disappointing 2018 campaign marked by countless injuries, a Jeremy Cameron uppercut and a Toby Greene fly kick, and with ever-growing cap pressure, the close of the trade period marked an exodus of big names from Greater Western Sydney. Dylan Shiel, Rory Lobb and Will Setterfield joined the list of talented footballers to have departed the AFL’s newest club in recent years. As The Roar’s Ryan Buckland pointed out, their returns were as good as they could have hoped for from a difficult situation. And while others have marked the Giants’ offseason as a sign that the window is being slammed shut, GWS still have a bevy of stars among their ranks. The magic markers of a football career are 100 games and 25 years of age. It’s at this point that, barring injury, a player hits their peak. While the checkpoint won’t turn bad footballers into good ones, it does represent a time when the game begins to simplify for up-and-comers and the league’s most talented youngsters turn into genuine stars. This year two of the Eagles’ most talented players, Elliott Yeo and Jeremy McGovern, hit the criteria, and in the process a club many tipped to drop off – some even projected them to be wooden spooners – went on to win a premiership. 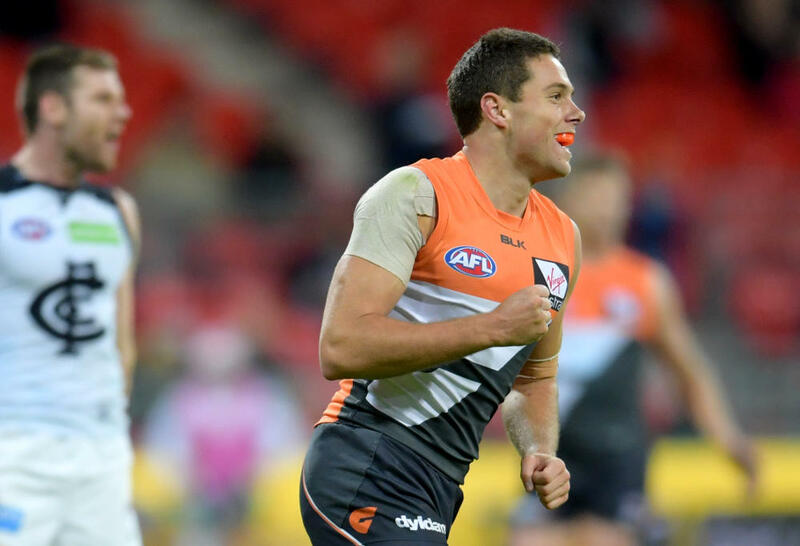 By the time next season kicks off Jeremy Cameron, Toby Greene, Jonathan Patton, Stephen Coniglio and Adam Tomlinson will still be 25 years old, with all but Patton having already cruised past the 100-game mark thanks to the Giants’ early commitment to playing the kids. 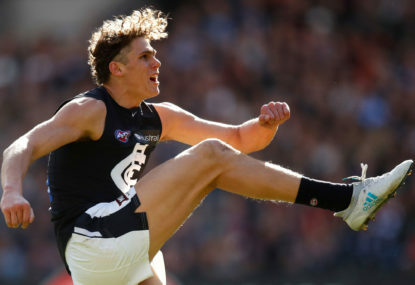 Potential Brownlow medalist Josh Kelly hit the 100-game mark before his 24th birthday, 24-year-old Lachie Whitfield has 100 games and an All Australian selection under his belt, and a full season for 24-year-old Zac Williams will see him hit the 100-game mark in time for finals. Throw in the quality selections that GWS have made thanks to them capitalising on the departures of big names, and they’ve stockpiled an armoury of journey talent – Harry Himmelberg, Jacob Hopper and Tim Taranto are all expected to hit the 50-game mark next season. Their veterans, team co-captains Phil Davis and Callan Ward, are ancient in GWS terms at 28 years old. Put simply, the Giants aren’t going anywhere and will remain a fixture of September footy for years to come. While salary cap pressure will continue to make depth a challenge, the Giants have as much top-level talent as anyone else. Yet with all that talent, the most important man on their list will be a 30-year-old journeyman with just 39 games experience. Dawson Simpson battled injury and selection while at Geelong, where he played just 28 games in six years. Arriving at GWS in 2007, he played only twice that year as the Giants continued to ride along with Shane Mumford. The 2018 season and subsequent trade period signalled the end of the failed Rory Lobb ruck experiment. 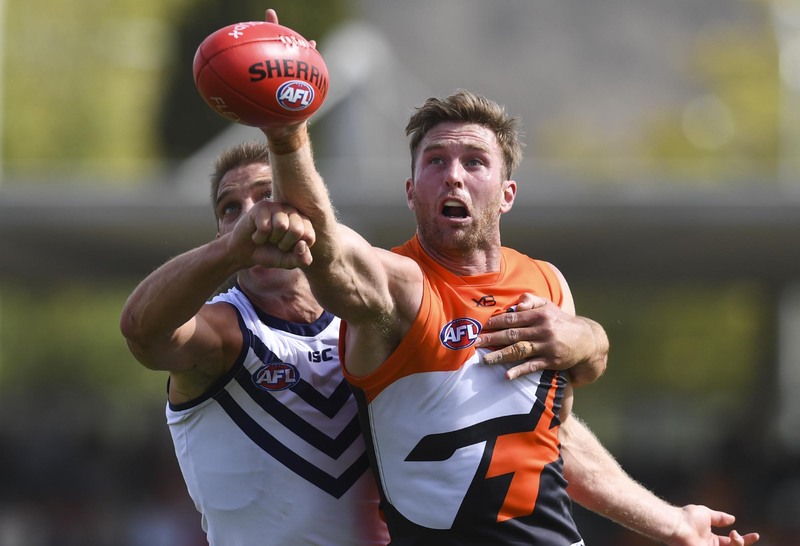 The Giants had hoped that Lobb’s mobility and contested marking prowess would counteract his ruck deficiencies and supercharge their ball-winning midfield. 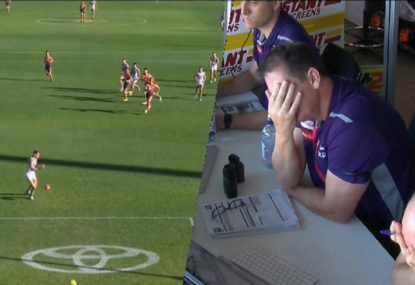 It simply didn’t work and Lobb was left the odd man out – a ruck liability and an unnecessary luxury in the Giants forward line, where his strength as a contested mark didn’t make up for the mobility and flexibility offered by the emerging Harry Himmelberg. The Giants finished with a record of 13 wins, eight losses and a draw. Dive into the numbers and Simpson shows a team that thrived on his selection. When Simpson played the team was a dominant 7-1-1. Without him GWS was a sad 6-7. While the record doesn’t show the strength of schedule, Simpson’s only loss was to the eventual premiers, the West Coast Eagles, but his victories included top-four sides Richmond and Hawthorn. His biggest stretch of football, rounds 14 to 20, after which his season ended in an injury sustained against Carlton, was 6-1. 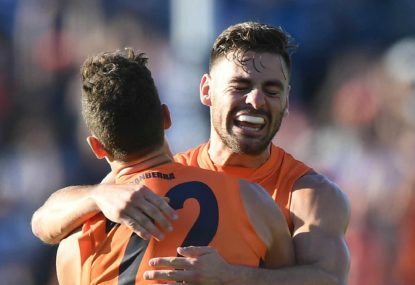 After his injury the Giants’ form slumped again, with losses to Sydney and Melbourne to finish the season. 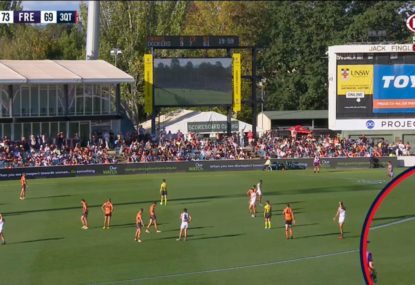 After overrunning a lifeless Sydney, the Giants were sent into the off-season by Collingwood, losing the match by ten points, contested possessions by 22 and hit-outs by 15. Such is the talent of the Giants midfield that they don’t need a dominant ruckman or the mobile tall that Lobb attempted to be; the Giants simply need a man to halve the contest and fight in the trenches. The narrative of the Giants ‘tsunami’ – a running surge of half backs and midfielders out of their back half, wasn’t born out preference but of necessity. With Simpson in the ruck the Giants didn’t have to wait to get the ball back in defence; they could have the ball from the contest. The Giants were mediocre in the contest in games without Simpson. They had a -14 differential in hit-outs led to a breakeven in clearances and a contested possession differential of just +1. But with the 210-centimetre, 109-kilogram man mountain, those numbers skyrocketed. A -2 hitout differential, which included an understandable -16 against Aaron Sandilands and a -29 against the Nic Naitanui Scott Lycett combo, turned a +7 clearance differential and a whopping +20 contested possession differential. While I wouldn’t expect Shane Mumford to return, the Giants will look to bolster their ruck stocks, most likely with a mature ready made footballer. The only current prospects behind Simpson are Lachie Keefe, who isn’t a ruckman, and Matthew Flynn, who despite being 200 centimetres tall hasn’t played a game of AFL and shouldn’t be expected to lead the ruck for a premiership contender. So while the naysayers write off the Giants and their talented stars will get the headlines, Dawson Simpson is the Giants MVP.